Main Feature: Interview with Helene Fischman | The River - Moved! This month I had the pleasure of interviewing Oakland, California-based artist, Helene Fischman. Helene, you are a photographer, painter, poet, and educator. How did these various roles develop within you, and how much does each role play in your life as an artist today? My degrees in Fine Arts and Education are held together with a strong weave. For many years I was a fulltime educator, constructing curricula based in rich creative components of visual arts, poetry, music and stories. I am a multi-disciplined artist, so I was able to work across a variety of creative platforms, but in all cases constructing opportunities for children to engage more fully in learning. During the last ten years, I shifted from school administration to art creation. I have been focusing on creating site-specific artwork through artist residencies which incorporate both the making and teaching of art. My two mediums are photography and poetry. You seem to find inspiration in many areas, from nature to culture to politics. Would you say that one area is more dominant than the others, and if so, why? Photographically, I tend toward capturing both ancient and contemporary aspects of places. I look for the quiet evidence of history which falls uniquely at its own designated time, often in secret places. Being outside….seeing, hearing, smelling, touching nature, helps me tune into history the way that an academic might feel by inspecting journals and first-hand documents. The sensory experience promotes an understanding of the synthesis of time and space. One cannot look at the sea without hearing its roar, smelling the salts rushing onto the shore, while understanding, if not standing in awe of, the timelessness of its repetitive tide. Poetically, I was inspired by American poet Jehanne Dubrow at the Auschwitz Jewish Center in Poland in 2004. During our artist residency there, we created a paired series of paintings and poems telling the story of the 500 year old Jewish community from the region. I found that using both word and images provided a deeper and richer opportunity to tell a story. The use of word and image provided more inroads for the viewer, and could be immediately accessible to various types of learners and thinkers. For the concrete learner, for example, or for those who find it difficult to dissect image alone, the image can open up the idea and the words can give it meaning. For those who find difficulty in digesting abstract thought in poetry, the image can ground the viewer. Pairing art and poetry enables telling stories of an experiential nature, fostering the link between past and present, encouraging the development of empathy, and drawing links between real life and history. Both words and images provoke emotional response and new thought in the viewer. Tell me about one of your experiences as an artist-in-residence. One of the things I love about doing artist residencies is the adventurer it brings out in me. Upon landing at a new park, new state, it’s just me, maps and camera ready to go. When I was in Joshua Tree in 2007, for example, I assumed that I would photograph its tree of fame. The Joshua Tree is so dynamic; it looks like a twisted knotty skeleton stretching out after a great desert nap. But one day when I was exploring the local towns outside of the park, I stumbled upon abandoned Homesteads which still stood on the edges of old Rte 62. They were incredible old relics from the last recipients of the Small Tract Act of 1938, telling stories I could never have imagined. My project there ended up being a portrait of the Park through the windows of these crumbling little old buildings. I could not have planned this project ahead of time, it developed as a result of spontaneous local exploration. Helene’s work has been exhibited internationally and can be found in many private collections including the Auschwitz Jewish Center in Oświęcim, Poland. 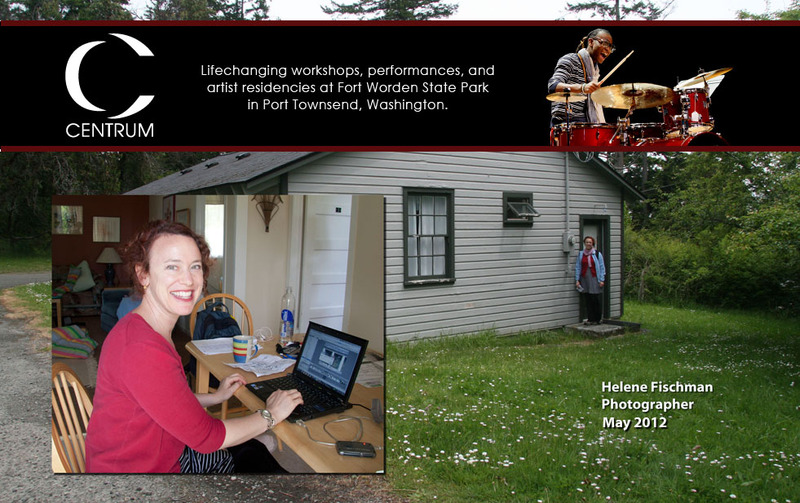 Focusing on the dynamic interaction of humans with their environment, Helene has done a series of site-specific artist residencies. Selected in 2005 by Hot Springs National Park as the first photographer artist-in-residence, Helene created a visual narrative of the transition from fall to winter in the Hot Springs North Mountain Range, Arkansas. This residency kicked off a new series of landscape narrative, and she has since been selected for artist residencies at Joshua Tree Highlands House, Whiskeytown National Park, The Illinois River Winery, Beaver Creek Valley State Park, Glacier National Park and Centrum at Fort Warden State Park. Her most recent project of paired poems and photographs is on exhibit at Urbano Cellars Winery in Berkeley, California. Three of her poetry-photos are in this issue of The River. Be sure to check them out! Helene…how specific and your background immense. I have family in Port Townsend, that is a unique place to live, rather thrive! This was an intro to Helene for me…interesting work…thanks. Great interview Sheila. I fell in love with Helene’s work the first time my eyes laid upon them. Now, I even love her work more. Awesome Interview.